Featuring showy lights and a costumed performer as the backdrop, these Broadway Drink Ticket templates help raise the curtain on a packed house of bar sales. Enter stage right with a stack of professionally printed Drink Tickets and watch your financial woes exit stage left. Start selling drinks in advance and collecting accolades. 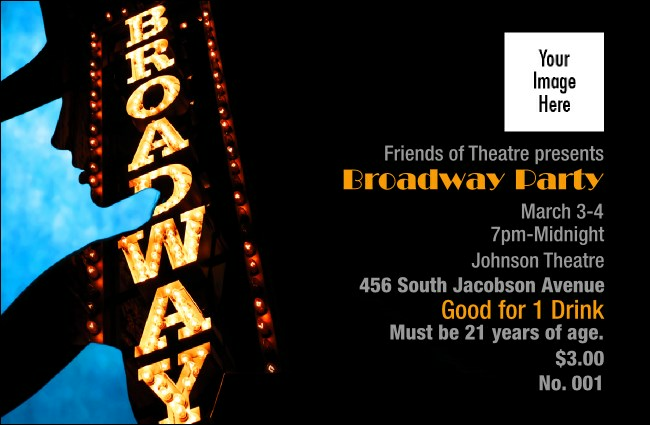 Turn everyday into Broadway with Drink Tickets from TicketPrinting.com!